Asset allocation decisions are perhaps the most critical factors in developing a plan to meet long-term investment objectives. Asset location (the integration of estate planning and asset allocation) can exponentially impact a family’s balance sheet and is core to our portfolio construction. Using low and non-correlated assets, our portfolios are designed to increase expected return without increasing risk or, conversely, to maintain risk while increasing prospective returns. Asset class risks/returns may diverge significantly in the short-term, but we believe they are ultimately driven by economic fundamentals and have predictable long-term relationship patterns. A disciplined and formal diversification program increases the odds of investment success (although it does not eliminate short-term swings). Ascension Wealth Advisors is a proven expert in the integration of asset allocation with estate, tax, and investment policy planning. We employ a rigorous analytical process in evaluating a wide range of potential investment strategies tailored specifically for your particular investment objectives. Ascension’s innovative technology helps us address big-picture asset allocation questions. For taxable investors, this means structuring the portfolio in a tax-efficient manner. Our Monte Carlo Simulation Model is created to help determine how much (or how little) risk you need to take to generate the cash flow you desire to maintain your lifestyle, leave a legacy for your family, and or meet your charitable intent. We operate in the real world, developing portfolios designed to achieve the true benchmark for success: meeting your unique goals. At every step, Ascension Wealth Advisors looks beyond individual investments to consider your overall investment strategy so that no matter what the market is doing, you are properly positioned. 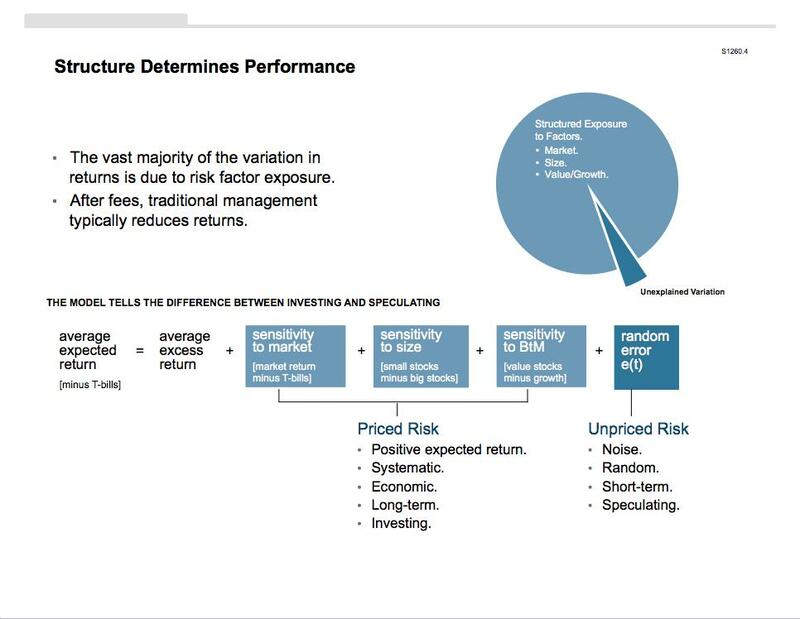 Risk and return are related. The compensation for taking on increased levels of risk is the potential to earn greater returns. Fees Matter. Active managers seek to beat the market through stock selection and market timing. They generally charge higher fees than passive managers as compensation for their perceived “skill.” These fees can inflict a significant penalty on net investment returns and terminal wealth.